DORVAL TRADING CELEBRATES ITS 50TH ANNIVERSARY! DORVAL has its own line of products under the Sour Powerâ brand, which celebrated its 30th anniversary in 2015, as well as their specialty brand Dorval Premium Collection® Chocolates and Cocoa, plus Top Pops® and Choice Confections®. Other brands represented under the DORVAL umbrella include Rademaker® Hopjes, Rendez Vous®, and King®. 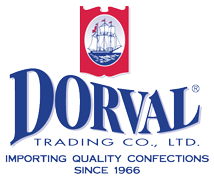 Since 1966, the DORVAL name has been synonymous with quality confections. For 50 years, DORVAL has been an importer of an extensive range of high-quality confectionery products from major manufacturers around the world. DORVAL has grown into a significant presence in the confectionery and specialty distribution arena. DORVAL TRADING CO., LTD. announces its latest SOUR POWER® item – SOUR POWER® SOUR POPPING CANDY! February 2016, Nanuet, NY– DORVAL TRADING CO., LTD. announces its latest SOUR POWER® item – SOUR POWER® SOUR POPPING CANDY! SOUR POWER® SOUR POPPING CANDY is the newest innovation from the minds at SOUR POWER®. The unique concept of combining their mouth-watering flavors with a popping candy didn’t just stop there. SOUR POWER® went ahead and created a blended pouch of SOUR popping candy, producing a combination of flavors such as Green Apple + Strawberry, Strawberry + Blue Raspberry and Sour Power Quattro®, a 4 color/4 flavor blended pouch. The pack designs are consistent with the bright and vivid colors consumers have come to know and expect in SOUR POWER®. They are packed in 12x18ct cartons, and make a great display for any shelf or counter. The new SOUR POWER® POPPING CANDY is available now. Dorval was instrumental in launching the sour craze in the United States in 1985 with SOUR POWER®, and celebrated its 30th brand anniversary in 2015. SOUR POWER® SOUR POPPING CANDY joins the rest of the Straws and Belts in wrapped, unwrapped or bulk format in a variety of package types and flavors. Dorval Trading Co., Ltd., is an importer of an extensive range of high-quality confectionery products from major manufacturers around the world. Dorval has grown into a significant presence in the confectionery and specialty distribution arena. In addition to the Sour Power® 30th brand anniversary in 2015, Dorval celebrates their 50th anniversary in business this year.